The Iowa DOT estimates the state could collect about $40 million a year from farmers and construction companies if the tax exemption for so-called “red dye” fuel was lifted — and a few lawmakers are questioning why that tax advantage is being maintained. Farmers and construction companies that primarily operate diesel-powered machinery off of the state’s roads buy fuel that has a dyed with a red tint, to signify it is not subject to the state’s fuel tax. Representative Ralph Watts, a Republican from Adel, says the size of farming operations has grown significantly and heavy farm equipment is now being driven on more miles of road to get from field to field. That “additional stress” is taking a toll on rural roads and bridges, according to Watts. Watts tried, but failed this past week to get his fellow legislators to go along with charging just a 10-cent-a-gallon state tax on red dye fuel. 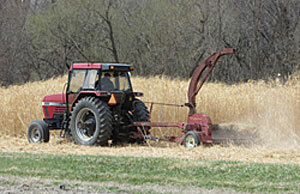 The Iowa Farm Bureau opposes the idea of taxing the diesel fuel that’s used in farm equipment. Only eight other members of the Iowa House joined Watts this past Tuesday to try to force a debate over his proposal, while 87 voted against Watts and his idea was permanently tabled.